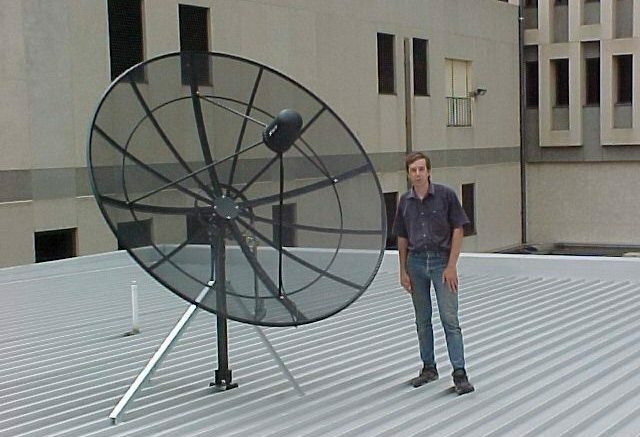 It may have been all the rage when Radio Shack put it on the cover back in 1986, but the C-Band satellite, also known as the “Big Ugly Dish,” is really a thing of the past. If you see these around town, you’ll probably notice a lot of them have grass growing up through them, and even more have a smaller satellite dish next to them. Why has C-Band satellite disappeared? There was a time when every broadcaster put its satellite feed up completely “Free to air” in other words, unencrypted. Why would they worry about it after all, when the only people who could receive the signals were cable companies and other broadcasters? Unfortunately, by the late 1980s plenty of people started to put up home-based satellite setups. They weren’t very good, and every satellite had to be tuned individually, but if you knew where to look you could find premium channel programming, local news feeds, in fact almost everything you could find on cable TV could also be found for free on a satellite. Obviously that couldn’t last long. If everyone had a satellite dish then cable companies couldn’t make money. The answer was simple: encrypt the signal so that you had to pay to decrypt it. It took some wrangling to make sure this was legal, but once the stage was set, every broadcaster started moving to encrypted feeds for anything that was worth money. When DIRECTV and DISH started really taking off in the early 2000s, it was clearly the beginning of the end for that gigantic dish and for free-to-air satellite. The dishes were still plenty expensive and required a lot of maintenance, so why bother using them? Slowly, the number of free satellite sources dwindled. Today there are a handful of free feeds out there… check out lyngsat.com to see what’s available now. The real death knell for C-Band satellite came with Android TV. Cheap streaming boxes like this one from MyGica MyGica Android TV Box (ATV-585) from Solid Signal now fill the market once dominated by the big ugly dish. Due to a thriving “pirate culture” a lot of the same content that was once available over satellite is now available on streaming servers and you just need to know where to look. While I’m not going to point you to any of the sites you’ll need, trust me a little Google searching will help you find pretty much anything you want to find on the internet. Now, once forward-thinking techies struggle to know what to do with those big old dishes. Some have taken them down, often with saws and clippers, but most people have left them where they were, a sad monument to a time when satellite TV was free but dishes cost tons of money. Are you an old C-Band enthusiast? What’s your best memory of those days?